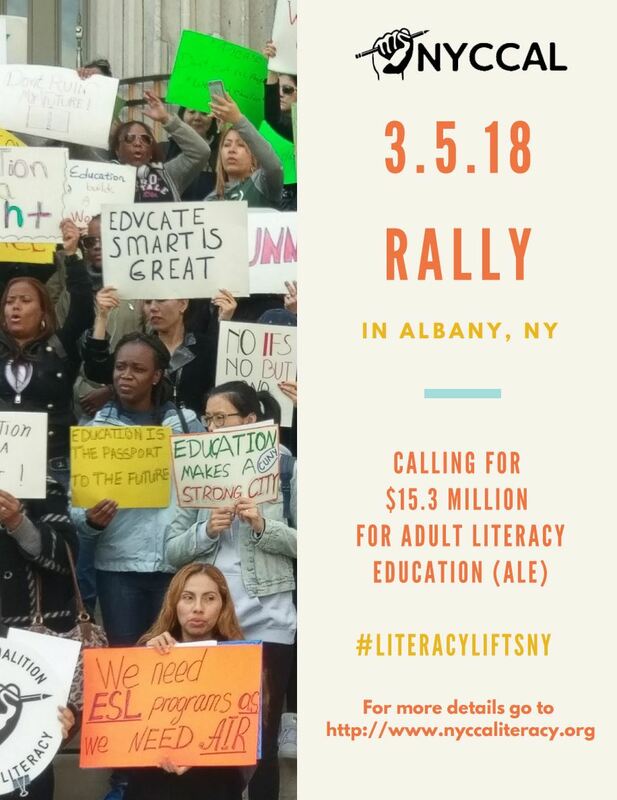 NYCCAL is holding a rally and press conference in Albany, NY, on March 5 in conjunction with Literacy New York, to call for $15.3 million in funding for Adult Literacy Education (ALE) funding. This would include the restoration of $1 million and add an additional $8 million to the existing $6.3 million in the current draft of the Governor's budget. NYCCAL is sending at least one bus from New York City to Albany on March 5. The bus will be leaving NYC at or before 8 am and returning by 7 pm. To learn more about getting a seat on the bus and/or attending the rally, please contact Kevin Douglas. 1.7 million New Yorkers lack English proficiency, a high school diploma or both. We request that $16 million in new investments – enough to support 13,300 students—be dedicated to adult literacy programs in the city budget. Step 1: Educate Yourself.See Advocacy Basics and What You Can Legally Do to learn the legislative and advocacy processes and what this means for you. See Using Your Time Wisely to learn when your advocacy can be most effective. Throughout the Advocacy Clearinghouse and Toolkit you will see blue colored links. This blue color indicates a glossary term. Click on the link to learn its definition. Visit the Glossary to find the complete listing of terms. Step 2: Build Allies.Legislators want to hear how adult education programs benefit adult learners, businesses, the community, and the economy. Involve adult learners and other stakeholders in advocating on behalf of adult education and literacy. See Who You Involve for ideas on building allies. Step 3: Learn About Your Legislators.Capture your legislators’ attention by “hooking” adult education and literacy to their issues. On what committees do they serve? What are their positions on national issues? What are their priorities? See What to Say and How to learn about messaging, creating effective hooks, making the Ask, and cinching commitments. Step 4: Establish and Maintain Relationships.You should develop relationships with all your representatives. In addition, see Contacting Legislators to learn about targeting legislators in positions of authority over adult education laws and funding: who you should contact and why. Find tips for calling, writing, and meeting with your legislator and hosting a visit. Step 5: Plan for the Future.Sometimes we have a lot of educating to do both within our communities and with our legislators before our advocacy can be effective. See Advocacy Strategies to learn what activities other advocates do. See Creating Responsive Networks to learn how to build local advocacy networks and evaluate advocacy campaigns. Recommendation: $10m investment ($3.7m expansion) in Adult Literacy Education (ALE) to create 3,000+ new classroom seats. Despite the significant cost to New York’s economy of having a large section of the workforce without English proficiency (Spanish-speaking adults with limited English proficiency lose approximately $3,000/year in earnings as compared to their peers), investments in improving the literacy and high school credential attainment among this population have been flat or only seen nominal growth. Only an estimated 4% of the 1.7 million New Yorkers lacking English proficiency are able to access state-funded ESOL classes. When investments are made in this population however, the returns are tremendous: for every NYC resident that earns a high school diploma or its equivalent (HSE), there is a net benefit to the City of $324,000 over their lifetime in terms of increased tax contributions and decreased public benefit utilization. Given that New York subsidizes the exam cost for every HSE test-taker, and pass rates are 23% higher for those in preparation programs versus walk-in testers, it is in the state’s interest to ensure ESOL and HSE preparation classes are available to all eligible adults. Recommendation: $5m investment in a new High School Equivalency (HSE) Transition Fund to support professional development and computer technology. Although in January 2014 New York took a historic step in being among the first states in the nation to phase out the GED® and replace it with a new and more rigorous examination aligned to the Common Core known as the Test Assessing Secondary Completion (TASC™), no resources have been dedicated towards ensuring the success of the transition. In order for students to succeed in this new environment, it is critical that their instructors have access to professional development opportunities to increase their own subject-area knowledge, as well as effective instructional methodologies. The State Education Department (SED) estimates that 1,200 teachers across the state are in need of enhanced professional development, and supporting each of these teachers is an investment that will yield student success and achievement. In addition, as the testing system increasingly moves away from paper and pencil testing toward computer based testing, it is imperative that students build their computer literacy skills to ensure that their success on exams is not limited by a lack of computer literacy. Investing resources for the purchase, and installation of computers, as well as technical support for adult education programs across the state will not only allow students to build essential 21st century technology skills and prepare them for success on computer based tests, but it will increase capacity of the State to actually administer HSE examinations. Given the widely felt concern about the implications of the introduction of a new HSE exam, NYCCAL made the decision to conduct a Survey of adult literacy programs to learn how students were doing on the new TASC. The Survey was distributed widely to the adult literacy field, and practitioners were encouraged to provide information on their experience with the new TASC. Program participation was fairly broad and included 28 CBO’s, two Educational Opportunity Centers (EOC’s), one CUNY College, a SUNY program, and two union programs. There were no responses from the NYC DOE, the largest of the adult literacy providers in New York City. In total, 36 surveys were received. Two agencies submitted data twice on the same program. Those agencies were contacted and identified which entry to be included in the data. Another agency submitted two entries for two separate HSE programs, and both were included in the Survey. Three agencies responded, but did not offer HSE preparation. Thus, what follows is a summary and analysis of the information provided by 30 agencies on 31 unique adult literacy programs. A listing of all the programs that responded appears at the end of the report. With regard to data contained in this report, programs were asked to answer questions to the best of their ability, and to approximate numbers where exact figures were not readily available. To see a pdf summary of the results, please click here.